Friedrich “Fritz” Geisshardt was born on 22 January 1919 at Sonnefeld, near Coburg, in Oberfranken. He joined the Luftwaffe in 1937. Unteroffizier Geisshardt gained his first victory on 9 September 1939, during the invasion of Poland, when he shot down a Polish PWS-26 trainer while serving with 2. (J)/LG 2. 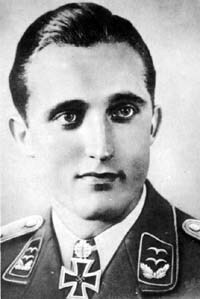 The following day, flying his Bf 109 E “Red 13”, Geisshardt himself fell victim to Polish PZL-11 fighters near Wloclawek. After several hours in Polish captivity, he was able to escape during the confusion of a subsequent Stuka raid. He and another captive grabbed a couple of horses and succeeded in reaching friendly territory after a five-day ride. Leutnant Geisshardt participated in the Battle of Britain serving with 1. (J)/LG 2. By the end of 1940, he had added six RAF aircraft to his tally. By spring 1941, he had added a further six victories. By the time I. (J)/LG 2 participated in the invasion of the Balkans, Geisshardt had been credited with 13 victories. Over Yugoslavia, Geisshardt was to claim four JKRV Fury biplane fighters shot down on 6 April 1941. During the invasion of Crete, he was to claim two RAF Hurricane fighters shot down. By the end of April, Geisshardt had been appointed Adjutant and was operating as part of the Stabschwarm of I. (J)/LG 2. Following the successful conclusion of the Balkan campaign the unit was withdrawn to Eastern Europe. Geisshardt was to achieve much success over Russia claiming 63 victories during his time there. He recorded his 20th victory on 23 June 1941. Leutnant Geisshardt was awarded the Ritterkreuz on 30 August 1941 for 27 victories. I. (J)/LG 2 became I./JG 77 on 6 January 1942 and Geisshardt flew with its Stabschwarm. He recorded his 40th victory on 1 March 1942 and his 50th on 19 April. He shot down five enemy aircraft on 20 April to record his 52nd through 56th victories. On 25 April 1942, he recorded seven victories (61-67). Geisshardt was appointed Staffelkapitän of 3./JG 77 on 26 April. On 23 June, Oberleutnant Geisshardt was awarded the Eichenlaub (Nr 101) for 82 victories. I./JG 77 was transferred to the Mediterranean theatre, arriving at Comiso, Sicily on 3 July 1942. Between July and October 1942, Geisshardt claimed nine RAF Spitfire fighters shot down operating over the island of Malta. He gained his 100th victory over North Africa on 10 November. In December 1942, Geisshardt was posted to III./JG 26 as Gruppenkommandeur. He gained two further victories on the Western Front before being hit by return fire from USAAF B-17 four-engine bombers on 5 April 1943. Bleeding profusely from a wound in the abdomen, he dove away from the battle and made a smooth landing in Fw 190 A-4 (W.Nr. 7051) „- P“ on the airfireld at Ghent, Belgium. Removed to hospital, he died the next day. “Fritz” Geisshardt was credited with 102 victories in 642 missions. He achieved 63 of his victories over the Eastern front. In his total are at least seventeen Spitfires. 16:30 PWS-26 2. (J)/LG 2 Near Lubica PZL-24?